The patented Folia™ line was designed to completely redefine the take-out and leftover experience. 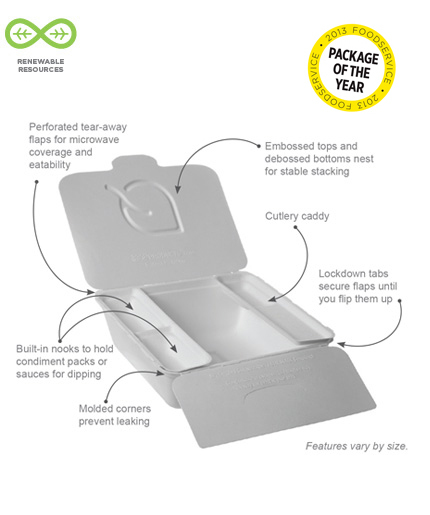 Innovative features include tear-away flaps for easier access to food, leak resistant side flaps that prevent spills and hold condiments and cutlery, and a full array of shapes and sizes that satisfy a broad scope of foodservice needs. It's also the recipient of the Package of the Year award from QSR Magazine and the Foodservice Packaging Institute as well as the iF packaging design award 2014 – Gold. Read All About it Here, And Here. 5.25 x 3.6 x 2 in. 6 x 5.4 x 2 in. 6.9 x 5.8 x 2.5 in. 8.25 x 7. 5 x 2.5 in. 8.25 x 7.5 x 2.5 in. 9 x 7.5 x 3.5 in.